Although I've had these shoes for almost two weeks, I never did an official post featuring these beauties. My purchases have been quite impulsive for the month of October, I suppose I'm just caught up in the season of fall and transitioning my obsession with whites/creams for spring and summer to blacks and greys for the fall and winter. I've got a couple other recent purchases to share, but we'll save those for another day. Thanks to blog posts by With Love from Kat and What the Chung? it became even harder to resist these boots. But luckily, with the help of a discount and my size being in stock, I just took the plunge. I've purchased many boots over the years, a lot of booties in particular. However, when Stuart Weitzman made the "Lowlands," I immediately fell in love. Last year, the 50/50 was probably one of the most popular boots for the season, they still are. I got myself a leather pair of OTK boots from Nordstrom during the anniversary sale, but there was just something about this suede that had me swooning over it. Of course, with any "it" item of the season, good luck getting your size. Luckily, Forward by Elyse Walker had one pair left. By some miracle, it was my size too. I was thrilled because they weren't restocking until December so naturally, I took this as a sign that it was meant to be. I received the shoes not too long after ordering them and I fell even more in love. They're so comfortable and easy to wear and I suggest to anyone that is hesitant about these boots to just do it. As for sizing, I know that some people have said to size down about 1/2 your usual, but with me being an 8.5/9, the 9 fit perfectly. They're a great investment that will last for many more seasons to come! I can't wait to post more looks with these boots. Have a great rest of the week! Handbags, handbags, handbags, where do I even begin? Over the past few years, my collection of purses in all shapes, sizes, and colors have grown. There are days where you need to carry everything, pretty much packing your life away, or you just want to carry a small cross body for the necessities. 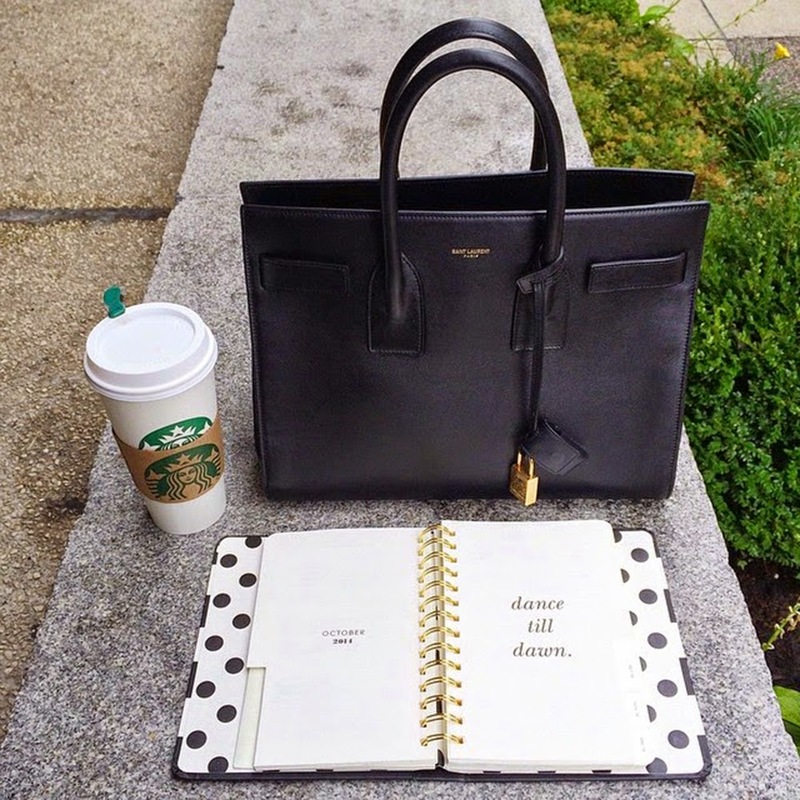 Rue La La just released their style guide for handbags and this inspired me to do a post of my favorite accessory! Because let's face it, with my skinny jeans and pull-over sweaters for the fall, where else will my long wallet, cellphone, keys, gum, charger, and make-up go? I'm quite guilty of spending my paycheck on bags and shoes, but can you blame me? I find these purchases to be investments. They're so beautiful and in order to understand it, you have to be able to appreciate the quality and craftsmanship behind a designer bag. Read more to see my favorites, something small, something medium, something large and what I carry inside them. I decided to pull three of my most used handbags! The smallest being my red Céline Trio in the large size, my Saint Laurent Sac de Jour, and my Louis Vuitton Epi Neverfull MM. These three bags were added to my collection this year and I haven't been able to get enough of them! I opt for a small cross body when I want to keep both hands free, such as a day at the park, a day that involves a lot of walking, or if I'm just looking to add a pop of color to my day. My top-handle, with the option of a shoulder carry with straps, is probably one of my most used bags. I can fit just enough in this without having to fuss around because of multiple compartments. My large tote is perfect for school when it comes to my MacBook, papers, and other school supplies. “Fall has always been my favorite season. The time when everything bursts with its last beauty, as if nature had been saving up all year for the grand finale.” ― Lauren DeStefano, Wither. That's probably one of the truest quotes I have ever read about the fall season. The magnificent colors that the fall season brings to New York never fail to take my breath away. I had the pleasure of going to Modena, NY last weekend with my family, and on the drive there, the foliage was just bursting with color. Although cloudy and crisp, some spot showers here and there, it was the perfect opportunity to wear some "perfect-for-fall-colored" pieces from Aritzia, not to mention my new watch courtesy of Daniel Wellington. My boyfriend and I enjoyed our first trip apple picking together, even though it involved a lot more photo-taking than actual apple picking. When people talk about fall, apple picking comes to mind, warm cider, leaves falling, pumpkin spice. Many also talk about the beautiful influence this time of the year has on New York City, however driving further north of the city truly is something else. I doubt that I could live anywhere else that doesn't have a season like this, I'm far too in love with the colors, weather, and the fashion that comes along with it. I wore a simple tee under this camel colored sweater and a cozy banket scarf to wrap myself in, all from Aritzia. I can't help but wear my Stuart Weitzman "Lowland" OTK boots as well, the latest addition to my designer shoe collection. I was able to get the last pair available on Forward by Elyse Walker because it just happened to be my size! I took it as a sign and ordered it right away. As stated in my last entry, this Daniel Wellington watch just came in time for the fall season because I've been looking for the perfect brown-strapped watch to wear with many outfits! You can find your perfect everyday watch on their website, full of wonderful pieces. You can also find them on Instagram at @danielwellingtonwatches/#danielwellington. Read more to see additional details on this outfit! This past summer Daniel Wellington had reached out to me to feature their watch including a promotional discount. I'm happy to announce that they've reached out to me once again to collaborate for a second time and I couldn't be any more excited to share with you a new timepiece that has been added to my collection courtesy of DanielWellington.com. My first piece with them was the "Classic Sheffield Lady," and I'm happy to share with you all my new "Classic Bristol Lady." What I love about Daniel Wellington watches is how their design is so simple and classic. Unlike other watches, they're very lightweight and can be easily worn casually or formally. The interchangeable straps make it easy to create multiple looks but maintaining the same face. I've been on the hunt for so long for a simple, yet elegant brown and gold watch to go with my more neutral pieces. The "Classic Bristol Lady" is that perfect watch. Stay tuned to see how I style this watch this fall! Be sure to check out Daniel Wellington on Instagram @danielwellingtonwatches and their hashtag, #danielwellington for all their beautiful pieces and how they're worn all around the world! I can't believe how quickly this year is going by. It feels like it was just yesterday that I was ringing in the new year with my family in the Philippines. Now, October is coming to an end meaning the holidays are right around the corner. Falling back into the routine of school and work, it's time to start saving up for Black Friday shopping and Christmas presents for the family. It's always around this time of the year that I really begin to reflect on just how much has changed in the past couple of months. This year particularly, has been very kind to the growth and development of my blogging and social media, and I know that I owe it to every single one of you that takes the time to read and check out my posts. I've had this sweater sitting in my closet for a couple of weeks already, purchased while it was still hitting 80-degree days because I was that excited for fall weather. I found myself looking at more and more turtlenecks to bundle myself in for the fall and winter and Aritzia delivered with their sweater collection for the season. I decided to pair this with a simple pair of leggings and OTK boots from Nordstrom. As for my handbag accessory, I opted for my Saint Laurent clutch, which doesn't get out enough due to the amount of things I carry and not having straps. However, when there's not much needed or there's a dressy evening out, I'll always take this clutch out for a trip. To be able to showoff the loose neck of the sweater, I wanted to tie my hair up in an attempt of a messy bun that didn't look too sloppy or too neat. Well, it's about time I did a complete post on my room! It feels like it's been a working progress for so long, maybe because it has. I started to make changes to my room in February of 2013. I spent a good majority of money from my birthday towards buying new furniture, bedding, etc. It started out as replacing some dated pieces from R&F that just wasn't my style. Since I started studying Interior Design in the Fall of 2012, I took a lot of what I have learned and applied it towards redesigning my bedroom to the best that I could. It took some time to get this together exactly as I sketched the idea two years ago, but it has definitely been worth it. It started out with my side table, then the dressers, a book case, clothing rack, and some decorative pieces. Those pieces got replaced in 2013. For a while that was it. It wasn't until this year that I replaced some pieces on my walls, got a brand new desk, new chair, and a brand new computer too! Since my last "Room" post in July, the only significant change is that it's a lot more crowded due to my shopping for clothes, shoes, and bags... and my computer! I'm not sure what else is in store, but for the time being, I'm quite happy with the result. Perhaps a new piece to hang over my bed since Audrey has been my main piece for years. Maybe I'll switch around the colors with my bedding? Who knows, but until then, enjoy the photos of what my space looks like! Details of where to buy certain pieces are listed at the bottom! I can't tell you how thrilled I was to need a coat on this day. My boyfriend and I decided to head into the city after plans to go apple picking got rained out this past Saturday. I finally got the chance to break out my new coat from Aritzia as we took a stroll through SoHo and Nolita. What I love about NYC is constantly finding a new place to see, never running out of ideas, etc. SoHo especially holds a very special place in my heart. I could walk through this neighborhood for hours, but not in heels on those cobblestone roads. Other than that, I should be fine! Leave it to me to find a wool coat when I was actually shopping for a parka. However after a bit of time in the fitting room, I've realized that I should get a coat for dressier and more sophisticated styles. I've got enough bulky-cold weather jackets in my closet, so I decided to go with something different. I love the straight lines of this coat, which I'll admit looked a little funny on the hanger, but looks incredible on. I can't wait to style this coat in many more ways including blanket scarves, sweater dresses, etc. It's pretty tricky finding a good coat that doesn't break the bank. Aritzia has an amazing collection but if that's still too steep, I've been quite impressed with Forever 21's coat game this season too! Bring out the layers because Fall has arrived! I know I've been saying this for a while, but the weather has now been reaching a steady 60-50 degree range. The crisp Autumn breeze was quite prominent this weekend and last, not to mention the change in colors of the trees. I've been able to wear coats all day, rather than only in the morning then sweating by the afternoon. Marco and I went to see a movie this day, Gone Girl, to be more specific. I definitely recommend checking it out! I read the book this summer and was immediately captivated by the darkness and suspense of it. After the movies, we passed by our favorite bubble tea spot before heading over to a park. Read more to get details on this look and shop the pieces below! I kept this outfit fairly casual, skinny jeans, tee, and an overcoat to keep me warmer for this day. I've probably been opting for my Citizens of Humanity - Rocket Porter skinnies 75% of the time since I purchased them last month. COH has always provided such amazing stretch and it's cut in all the right ways. I'll definitely have to make another investment soon in some solid black skinnies. If you haven't noticed, my outfits seem to be pretty black and white. I tend to gravitate towards a dark shade for my bottoms and lighter hues when it comes to my tops. Trust me, you're going to be seeing a lot of whites, beiges, and creams in sweater form for the next couple of weeks... I hope everyone had an amazing weekend and have a great rest of the week! I know I'm already counting down to next Friday already. In honor of National Handbag Day, I'm doing a post on one of my most favorite and oldest bags in my designer collection. As stated in a previous post, I've always had a thing for purses. When I turned 16, I got a Coach bag and there was no turning back. As I started to work for minimum wage, I was able to save up enough to buy a few Marc by Marc Jacobs bags, which took up a good majority of my handbag collection at the time. Of course, as I got older and my style changed, I developed a better eye for fashion and designers. Over the years, I have been able to expand my collection to designer bags such as Saint Laurent, Céline, Chloé, Chanel, etc. Some have been gifted over birthdays and Christmases, others, I have saved up for on my own. I love all my bags and make sure they're kept clean and maintain their shape to ensure a long life of beauty and use. A post on my entire collection will have to wait for another day because for this particular post, I'm honoring just one that I find to be quite the classic. The Louis Vuitton Mahina XS bag is a limited edition bag that is now discontinued and can only be purchased through pre-loved/consignment retailers. This was a gift from my father in August of 2008. I was seventeen at the time and I'm now twenty-three but still in love with it as ever. Normally, someone's first "Louis" would be a 'Speedy' or a 'Neverfull.' I've had my fair share of LV bags, five in total. The first was a Multicolore, then this Mahina, Patchwork Denim, Damier Ebene, and lastly Epi. I've consigned three of those bags, only leaving me with the Mahina XS and Epi Neverfull, but I don't mind. Other LV pieces in my collection include the 'Multicolore Koala Wallet,' 'Classic Monogram Passport Cover,' and 'Denim Key Pouch.' You can say I've got a thing for Louis Vuitton. Read more to get additional details on this bag and shop mentioned/similar pieces below. 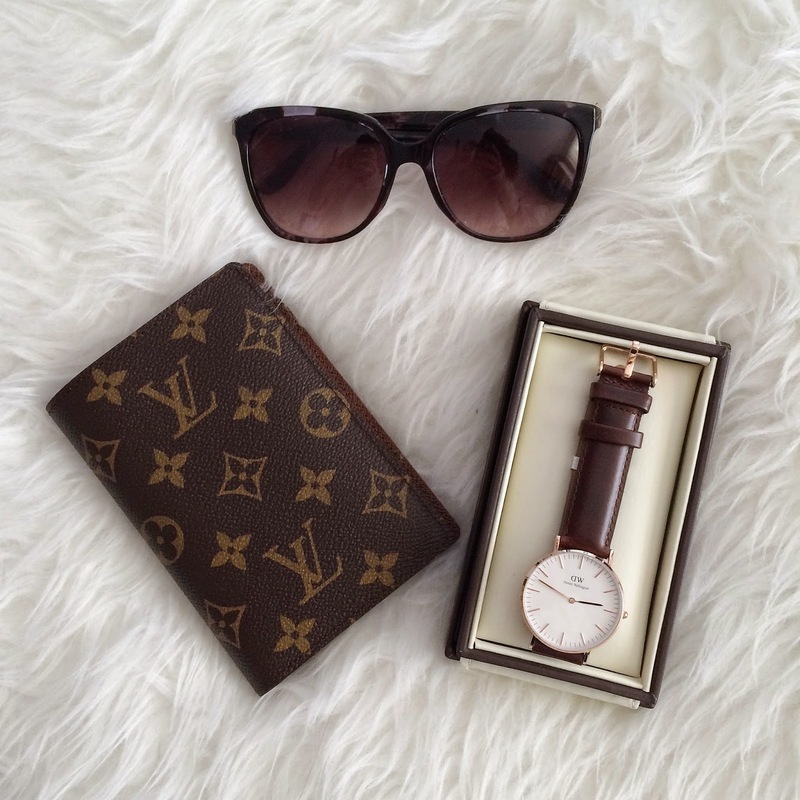 Featuring: Louis Vuitton Mahina XS. Production Year: 2008, discontinued. Material: Calfskin with perforated Monogram pattern. It's one of my favorite times of the year, Fall Foliage! This is something that I truly love about living in the northeast, the colors of the trees in October are absolutely stunning. The leaves started to change this past week and I caught a glimpse of it while spending the weekend in New Jersey. My family is planning a trip upstate to go apple picking and I think I'm more excited about the scenic drive than the actual destination. Continue reading to see more photos of this look! For this look, I put on my brand new skinny jeans thanks to 7 For All Mankind. I was thrilled to collaborate with them and these are probably one of the most comfortable skinny jeans that I own. Bordeaux and wine have made it's color way into my heart because I'm constantly drawn to it, whether it be my sweater or scarf. 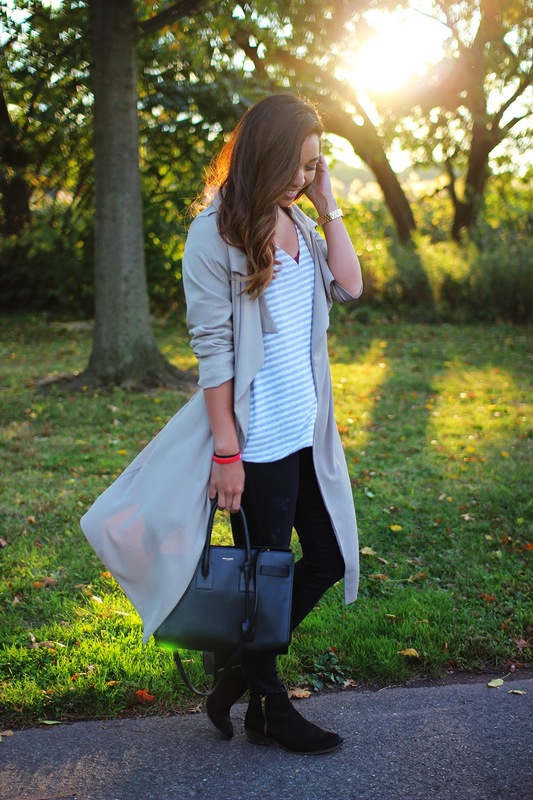 Another thing I've been wearing on an almost daily basis is my draped trench from Urban Outfitters. It's the perfect light layer to throw over any outfit. As for my bag and shoe combo, of course I went with my reliables, Saint Laurent and Steve Madden. I knew that buying these boots were a good choice because I've been wearing them almost everyday as well! I hope everyone has a great rest of the week!